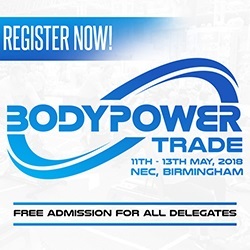 BodyPower, a fitness exhibition which celebrates its ten-year anniversary next May 11-13, recently announced the introduction of BodyPower Trade specifically for B2B visitors, which will run at the same time as the already highly successful BodyPower Expo. Held at the NEC each year, BodyPower first ran in 2009 with just under 8,000 visitors attending, taking up one of the NEC halls. Fast forward ten years, and the exhibition now covers five of the NEC halls, totalling over 60,000msq, and next year will see well over 100,000 visitors attending, from over 100 countries. Whilst initially starting out as a consumer event, the exhibition has progressively attracted more and more visitors from the trade side of the industry each year – last year saw over 20,000 trade visitors attend. The move to add a specific B2B only hall to the event enhances BodyPower’s long-term plans to make the event a one-stop-shop for the industry. Whether you’re a consumer looking for the latest supplements or clothing, or you’re an industry professional wanting to source the latest fitness equipment or software for your facility, BodyPower will have it all. If you’d like more details on getting involved with either BodyPower or BodyPower Trade, call the team on 01926 485423. Tickets to BodyPower Trade are free of charge, and can be obtained by visiting http://www.bodypower.com.